This is Kitty in his favorite position. Nathan (freakin_hilarious) started calling him Kitty the Hut awhile back. He really does look very similar! Here he is squinting very cutely. LOL! this is too funny!!! What I find absolutely fantastic about his nickname is not just his shape, but even the look of discomfort in his facial expression resembles Jabba! That's so funny! I feel like I'm supposed to say to him "Kitty, I've come to bargain for the release of my friends". On a more serious note - I like the deep texture in the fur. The furrows and crevasses in his fur make it appear as if he has tiger stripes. It also seems as though your whole hand would disappear if you poked his belly. Lighting, colors and pose all perfect! Love this photo!!! What a capture! Made it one of my favs. One of my cats is large like this and very lazy. Our vet has him on a diet now. We'll see... he's such a great companion and loves affection. Message edited by author 2006-10-29 23:21:25. Funny shot, I would agree he is a kitty the hut. But the lighting done on this is fantastic. how did you accompish it? What a lot of cat you have :-) Great lighting and detail to show off every bit of him. "Kitty the Hut"- too funny, gave me my belly laugh for the day ! ROFL!!!!!!!! "Your Jedi tricks will not work on me!!!" ROFL This is wonderful. Our kitty was almost that big. Put her on low cal kitty food and she lost 1/4 of her body weight and now she's all perky and healthy. This expression cracks me up - totally!!! he does look rather large. 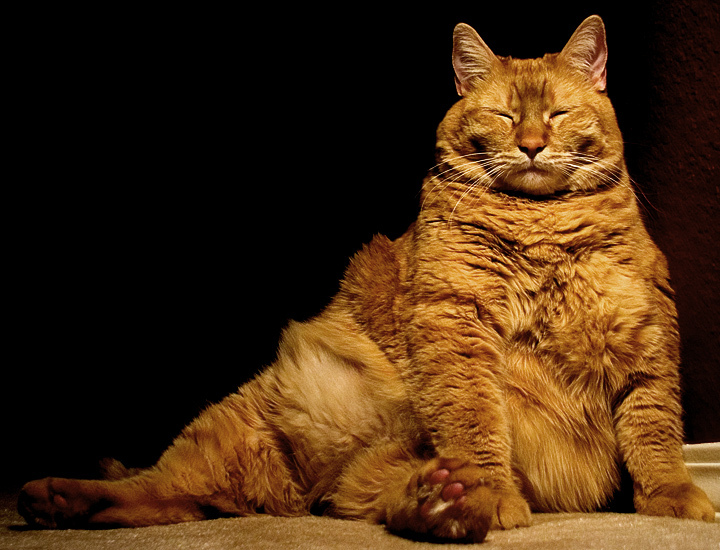 we need to have a fat cat competition. Oh, nice photo by the way, you've captured the moment well. Yeah baby! This is a great shot. Cant beat that pose. The colors and comp are very nice. The variety of angles on his fur looks cool and the background just helps keep all the focus on "the Hut". Come up with a cool caption and you have yourself a pet calendar submission. He's a beauty - absolutley PLUSH! LMAO ... he reminds me of my own kitty! I just LOVE a healthy Kitty the Hut!! This photo is great!! Proudly hosted by Sargasso Networks. Current Server Time: 04/19/2019 11:13:54 PM EDT.